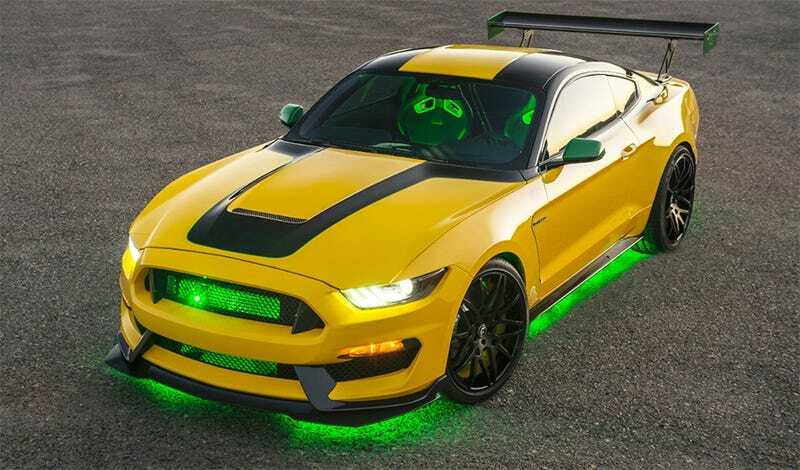 Ford has decorated a Shelby GT350 as a tribute to legendary U.S. Air Force pilot Bob Hoover and his P-51 stunt plane “Ole Yeller.” It will be auctioned off for charity, which is wonderful. But why’d they have to go and make it look like a tuner car from 2001? With an enormous V8 putting down 526 horsepower and 429 lb-ft of torque through a six-speed manual, the car is undoubtedly a lot of fun to drive. Which just makes it that much more painful that it looks like a b-list Fast & Furious prop. “Ole Yeller,” the airplane, apparently still holds the coast-to-coast propeller-powered speed record with a 5 hour 20 minute flight from Florida to California according to Warbird Depot. Bob Hoover was at the controls for that flight and “over 1,000" air show performances all over North America over his impressive career. Did anybody else know air races had “pace planes?” What a job. The P51 is still rocking its green-on-yellow livery, and today is owned by a Mr. John Bagley who keeps it at the Legacy Flight Museum in Rexburg, Idaho. It’s indeed still operational and gets out for air shows. “Ole Yeller” the car also has a green-(and black)-on-yellow color scheme, plus an enormous wing and neons. Neons. Or probably LEDs, actually. The actual method of light generation is irrelevant; the aesthetic crime against good taste is egregious. The new Mustang bodystyle is very tidy looking in general. This wing and weird accents were just enough modification to throw that all off. Of course I feel a little guilty ragging on this machine, since it’s being auctioned off with proceeds benefitting the Young Eagles charity initiative that gives kids free flying lessons. But if we don’t lampoon ugly custom builds, they’ll only get worse. Just let big wings and under-lighting die already.